Elections in the US are just around the corner, and it looks as if, once again, the results will ultimately hinge on outcomes in a few swing states. Perhaps foremost among these is Florida, where almost 25% of its African American citizens are disenfranchised because they are either felons or ex-felons. Florida, however, is not an outlier. In Kentucky and Virginia, over 20% of all potentially eligible African Americans voters will not be able to cast their ballot in November, while in six additional states the percentage is in the teens. Although it is becoming difficult to ignore the brutal state violence that has all too frequently been unleashed against African Americans—and that usually goes unpunished—many people are still ignorant of the fact that 12% of all black men are denied the right to elect the people who govern them due to previous or present incarceration. By contrast, only 2.5% of the general population are not allowed to vote—surely another manifestation of black lives not mattering. But what do human rights scholars have to say about this in their academic writings? 12% of all black men are denied the right to elect the people who govern them due to previous or present incarceration. To our dismay, not much. One reason for this is that in sociology and political science most human rights scholars use cross-national datasets for their research, and when measuring the protection of human rights, these datasets routinely rank the US extremely high. For three decades (1981-2011), for instance, the Ciri Human Rights Data Project has given the US a ranking of two for Electoral Self-Determination, a variable that measures the “extent citizens enjoy freedom of political choice and the legal right and ability in practice to change the laws and officials that govern them through free and fair elections.” A score of two signifies “that political participation was very free and open during the year in question and citizens had the right to self-determination through free and fair elections in both law and practice.” The lived experiences of many African Americans are clearly not captured by this dataset. Freedom House, which aims to provide “an annual evaluation of the state of global freedom as experienced by individuals,” also ignores the daily lives of African Americans. It defines political rights as those rights that “enable people to participate freely in the political process, including the right to vote freely for distinct alternatives in legitimate elections....” The organization claims that it places the greatest “emphasis on whether these rights are implemented in practice.” In the 2015 survey, as in preceding years, the US received the highest ratings for this right, revealing, as it were, that this dataset too is biased. Human rights scholars who use these datasets tend to receive large grants, train PhD students and shape the human rights field in the social sciences. Yet, they also know full well that the datasets they employ are skewed, and that their findings about our current political reality are consequently blinkered. Insofar as research has an impact on reality—something most scholars aspire towards—then by choosing to use datasets that obscure the lived experience of blacks as well as other forms of egregious discrimination, scholars become complicit in helping to maintain social wrongs. Take a concrete example in which this skewing occurs: human rights scholars who have been examining when, why and how international human rights norms shape state behavior. Intrigued by the immense variation in implementation of human rights norms among states, these scholars have embarked on comparative cross-national and longitudinal research projects that aim to identify the factors that can account for these differences. Some of these scholars have used the concept of “decoupling” to conceptualize the widespread phenomenon of states that sign conventions but do not comply by these conventions’ norms. Decoupling denotes the phenomenon in which organizations adopt policies ritualistically without actually changing their practices. Human rights researchers have found this concept useful for pointing out the gap between states’ expressed commitment to human rights principles—e.g., in the form of the ratification of human rights treaties—and their actual implementation of human rights norms. Setting aside their actual findings, these studies stumble into the pitfall of "methodological nationalism" since they relate to a state's whole population as if it were a homogenous unit, while ignoring the differences among the groups within the state. They do not take into account that decoupling is always differentially applied, and therefore their studies actually help conceal the uneven distribution of human rights across a country’s population. 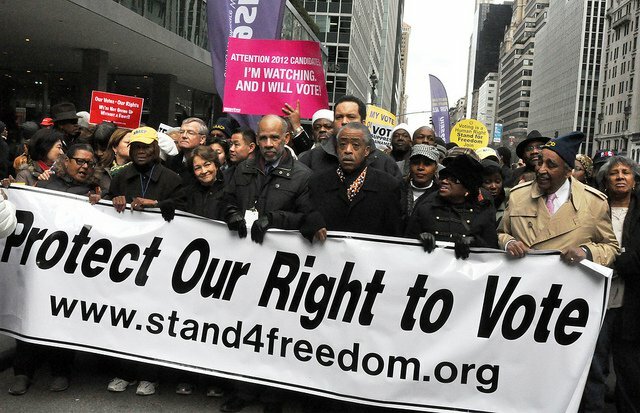 A demonstrate for the protection of voting rights in New York City, 2011. Disproportionate incarceration rates among African Americans lead to widespread disenfranchisement of this demographic of American society. This can be clearly seen when examining the right to vote in the US, a right that serves as the cornerstone of any democracy. Sociologists have shown that a stratified race, class and gender system leading to a very high proportion of incarceration among African American men, combined with legislation (whose roots can to be traced back to the mid-19th century) denying felons and ex-felons the right to vote, are the main factors leading to this unparalleled level of disenfranchisement among one particular group. In order to understand the high rate of African American incarceration, which is the primary cause for their disenfranchisement, a variety of factors need to be considered. These include differential patterns of sentencing according to race and ethnicity, the intersection of race and low educational achievement and its impact on incarceration, as well as class inequality, which includes both education and the intersection of race, low wages and unemployment. Also pertinent to African American incarceration is the effect of neighborhood characteristics and spatial contagion on recidivism as well as the relation between family structures (single parenthood) and incarceration. Human rights scholars using cross-national datasets ignore all of this and consequently play a role in concealing the uneven implementation of this right. Crucially, when the varying outcomes are concealed then the processes that produce them—including institutionalized racism—are also covered up and over. Once we begin to think of the different groups within a given country, then it becomes clear that improving human rights practices requires a much greater effort than is usually assumed in the implementation literature, since it must include the dismantlement or the dramatic transformation of power structures and institutions that create hierarchies by privileging certain groups and discriminating against others. But this is only part of the problem of much of the implementation literature. Another shortcoming involves the mistaken assumption that “more implementation" necessarily translates into the improvement in human rights practices. “More human rights” sometimes means more human rights for one group and no human rights for another, which suggests that the implementation of human rights can actually deepen stratification. By concealing the uneven distribution of human rights across a country’s population, these studies elide their lack of adherence to the most basic principle underlying human rights: namely, universality.